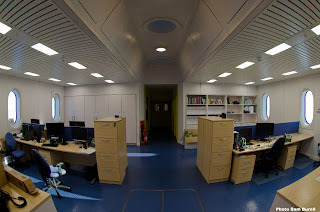 This blog is still getting lots of hits, and I know some ex-Halley people who are keen to see some more of the inside of Halley VI, so here are a couple more pictures. 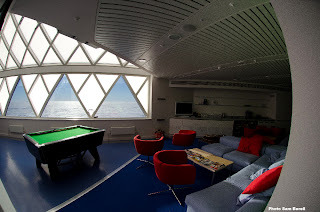 The lounge area of Halley VI - Photo Sam Burrell. Halley VI office - photo Sam Burrell. At the bottom of the picture of the office you can see the trap doors that lead into the under-croft - this is where many of the services such as water pipes and electrical cabling runs. Here are Hugh Broughton (Halley VI architect) and Karl Tuplin (Haley VI project manager) in the under-croft. Halley VI is a remarkable research station, and a remarkable building generally. Far more comfortable than the previous Halleys, but also (and more importantly) far more capable scientifically. Research Engineer with British Antarctic Survey - making cool things work in cold places.